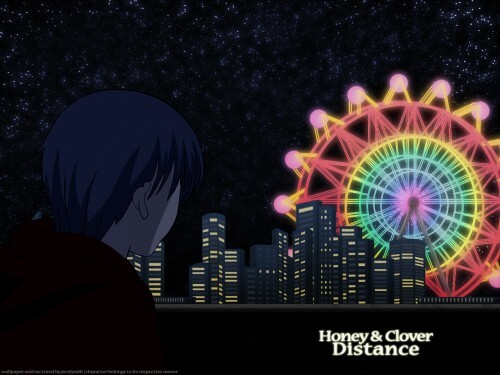 Honey and Clover Wallpaper: . : Distance :. Minitokyo »	Honey and Clover Wallpapers » Honey and Clover Wallpaper: . : Distance :. hmm..I always wanna make a HC wallie with ferris wheel..
the first idea of this wallie was only city and ferris wheel, i wasnt planning to include any characters inside..
however, when i was making this wallie, i thought insert characters would be better..
its very well done, but I still have a few critiques ^^' the star field, needs some work, but you'll get good at it as you make more and more, remember to experiment! that tutorial is the best in the web, so good job on that. Also, the ferris wheel stands out way too much from the overall dark wall, I would kind of lower its brightness and contrast a bit. The buildings are a nice addiction but the black space between the charcter and them bothers me, I would add some water so make a river ^_^ other than that its a great wall!! Cool wallpaper !! Like the ferris wheel, just that a bit too dark .... Nice work !! Thank for sharing !! I've been looking everywhere for a nice Honey & Clover wallpaper, and this is perfect :D Thank you so much for this wonderful piece. I love the colors on the ferris wheel. damn, I love ferris wheels! great wallpaper, i love it! Me encanta la manera en que trabajaron los vectores en esta imagen. Gracias.